Obamacare Repeal Could Threaten Kids' Health Coverage In Arizona : Shots - Health News Arizona has one of the highest rates of uninsured kids in the U.S. The federal health law put a dent in those numbers, but child advocates fear any gains will disappear if the law is repealed. 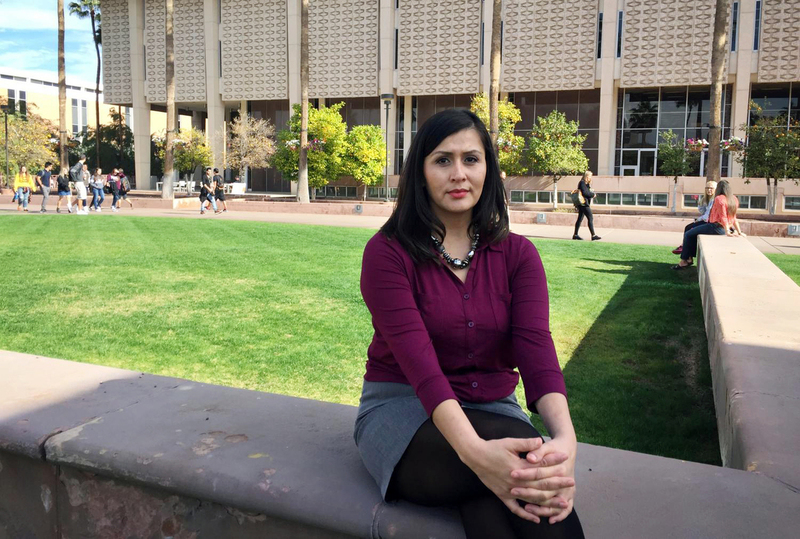 Vanessa Ramirez was diagnosed with ovarian cancer when she was in college. Today she and her kids get their health care through the Affordable Care Act. But child advocates say a repeal of that law could jeopardize the program that covers her children. Like any college student, Vanessa Ramirez never expected chemotherapy would be part of her busy school schedule. 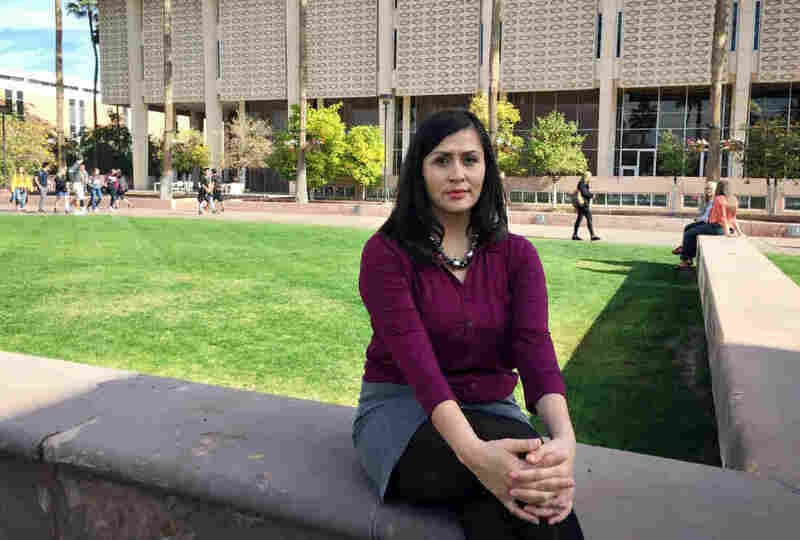 "I don't have any history of cancer in my family, so it wasn't something I was on the lookout for," Ramirez says, sitting outside the library of her alma mater, Arizona State University, in Tempe. Ramirez was diagnosed with ovarian cancer when she was 23. Now, more than a decade later, she's healthy and so are her children. "But there are also emergencies that happen," Ramirez says, explaining the priority she places on health insurance. "I have two young kids who are running around. They are rambunctious. I have a daughter that loves to climb trees." After dealing with her own serious illness at such a young age, Ramirez doesn't take health care for granted. And the Affordable Care Act made her feel secure that she and her kids would be covered. She bought insurance through HealthCare.gov, even with her pre-existing condition, and her children got covered, too. "I want them to be able to have health insurance and doctors to monitor them, in case something unfortunate comes up," Ramirez says. Ramirez has coverage via the exchange, and her kids are covered through the federal Children's Health Insurance Program, which is for working families who don't quite qualify for Medicaid. Arizona's version is called KidsCare. State lawmakers froze KidsCare enrollment back in 2010; Arizona was the only state without an active program. But last year Obamacare helped revive the program by covering the entire cost in Arizona and a handful of other states, at least through 2017. "A lot of people don't realize that a repeal of the Affordable Care Act could wipe out KidsCare, that we just got back," says Dana Wolfe Naimark with advocacy group Children's Action Alliance. In the months since Gov. Doug Ducey and the legislature reopened KidsCare last year, enrollment has already surpassed 13,000. But now Naimark worries about the fallout if the ACA is repealed. "It would be up to the state legislature whether they could invest state dollars to keep it going, or whether the coverage would go away," Naimark says. In recent years, Arizona has had one of the highest rates of uninsured children in the country. But Obamacare has begun to change that, bringing coverage to thousands of kids. Arizona was also one of the Republican-led states that expanded Medicaid under the ACA — but only after fierce infighting among Republicans in the Arizona legislature about growing federal influence. Conservative critics of KidsCare also retained some control over the budget of the program when they reinstated it; state law will halt or shut down Medicaid expansion and KidsCare anytime federal funding dips too low. "Whenever you take a look at some of these top-down Washington approaches, you really do lard up these insurance policies with a lot of benefits that individuals and families really would not go out and buy on their own," says Naomi Lopez Bauman director of health care policy for the conservative Goldwater Institute. Her organization sued to stop the state's Medicaid expansion. One of the proposals favored by Republican leadership is giving states a fixed amount of money, called a block grant, and letting them have more say in who and what they cover, in terms of health care. Bauman says the state, if given enough flexibility, could save money with such a system. The question, she says, would be, "How do you make it easier and better for individuals and families to get the coverage and care that best meet their own needs and preferences?" But other conservatives say changing how these programs are funded could backfire. Heather Carter, a Republican state representative who lives in north Phoenix, voted for Medicaid expansion and for restarting KidsCare. "What I hope does not happen is that decisions are made nationally that actually penalize us for being efficient and effective, long before the Affordable Care Act was in place," Carter says. Arizona already has one of the lowest-cost Medicaid programs in the country, she says. And Medicaid officials in Arizona caution that block grants could actually shortchange the state, because it has a fast growing population and a large share of people living on incomes that are around the poverty line. Less federal funding would likely force lawmakers to cut back services. "We will have to make very difficult decisions in Arizona on who will — and who will not — receive coverage," Carter says. If states lose the extra federal funding they received to expand Medicad and KidsCare, it would cost Arizona hundreds of millions of dollars to keep everyone on Medicaid covered to the same degree they are now. And even Democrats who support broad health coverage — including Senate Minority Leader Katie Hobbs — concede that's not realistic. "I don't see anyone in the state coming forward and saying, 'Oh, we'll cover this,' " Hobbs says. "Because we don't have the money to do it." Arizona has more children enrolled in the federal marketplace than almost any other state. If you add in Medicaid and KidsCare, roughly 130,000 kids or more could be at risk of losing their health care coverage if Congress doesn't come up with a replacement that is similar in scope. This story is part of NPR's reporting partnership with KJZZ and Kaiser Health News.